RUTLAND, VERMONT - Coming October 25 to the Brick Box (located at 30 Center Street, next to the Paramount Theatre) in Rutland, the "Ver-mericana" band, Miss Guided Angels, will release their long-awaited debut CD titled The One That Got Away. The doors open at 7:00 pm and with the admission of $10, you receive a CD or download card. Miss Guided Angels is coming off a successful summer run, including appearances at Roots on the River and the NoTown Festival. The band has also shared the stage with Burlington’s Gang of Thieves, Middlebury’s Crazyhearse and Shrewsbury’s Plumb Bobs. The new studio album features 10 tracks, covering folks, bluegrass, blues, rock, country and even a little rock-a-billy. The band features Lisa Gardner on vocals, guitar, and percussion, Bob Campbell on cajon/ percussion and vocal, Jimmy Kalb on fiddle and George Nostrand on vocals, guitar, harmonica and keyboards). So, (and when) how did Miss Guided Angels come to be? "We have been together for about three years and it started as a duo, when I invited Lisa Gardner, already a friend, to join me at a gig," George Nostrand said in a recent interview. She and I had played together, but she had really never performed on stage. We started at a little place in Stockbridge, Vermont called The Wild Fern, where bands generally play for small dinner crowds for tips. I ended up landing a weekly gig in Killington and convinced Lisa to join me. "I had known Bob Campbell, our percussionist for a while, and he fit in perfect with our sound, playing cajon or box drums that he makes himself. About a year into the project I met a young fiddle player who had just moved to the area from Louisville, Kentucky, Jimmy Kalb, and didn’t hesitate to bring him into the fold." The One That Got Away also features special guests Joey Leone on lead guitar, Kevin Maul on pedal steel and Catherine Miles on harmony vocals. 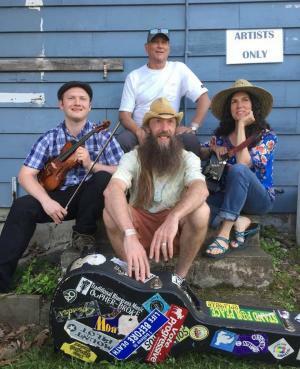 Plus a stellar cast of local artists, delivering Vermont Americana (or Ver-mericana) at its best; melding folk, bluegrass, blues, rock-a-billy and more with humor, sarcasm and wit, at no extra charge. "This is our debut release as a band and it is self-released. I have two prior CDs: a solo album (with 20 guests), “Radio Songs” (2005) and “The Shape of Things Today” (2011), with my other band, George’s Back Pocket, as well as a number of live CDs with George’s Back Pocket. "We don't currently have a label, but I’ve picked up a lot working for the (Rutland) Herald in the way of contacts, information, and being able to see what other bands are doing locally and around the world," Nostrand added. "More and more, you see bands putting out their own stuff, or small labels supporting the artists. This album feels really strong... our core band of acoustic guitars, vocals, fiddle and cajon is supported by some great players including Killington’s Joey Leone on guitar, Jesse Hongisto on upright bass, and other musical friends who added their spice. Phil also brought in a pedal steel player for a couple songs and some amazing background vocals on one of Lisa’s tunes. "Additionally, I played piano on a number of tracks and Phil added a bunch of stuff here and there, but it maintains it’s sound as our band, without being overproduced. There’s also a real variety of influences – true Americana – with folk, blues, bluegrass, rock, pop and even a waltz. With Phil’s wizardry behind the boards, we’ve turned out something I’m really proud of." Advance copies of the CD will soon be available, however, listen to the new CD at the Soundcloud link below. Soundcloud playlist: http://bit.ly/MGAplaylist. To learn more, visit the band's website at bit.ly/MissGuidedAngels. Also visit their Facebook page at: www.facebook.com/missguidedangels.